Earlier this year Nerds and Beyond had the opportunity to chat with Rachel Miner, Executive Director of Random Acts, a global non-profit dedicated to promoting random acts of kindness around the world. During that conversation we discussed the role charities play in shaping the world, and the everyday lives of people. As a follow-up, we wanted to highlight some of the amazing work Random Acts is currently doing, and share how you can get involved. 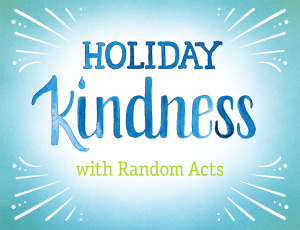 Over the past month, they have taken on and funded over 30 projects worldwide promoting #HolidayKindness. People have done everything from purchasing an incubator for an animal shelter in California, to buying holiday wishlist items for refugees and children in Texas, and giving festive treats to hospital staff in Amsterdam. We hope you too can find something that is meaningful to you and engage with #HolidayKindness in your community. If you live in New York City or Los Angeles, there will be in-person #HolidayKindness Workshops on Saturday, December 23rd. You can RSVP and learn more about the collection drives and activities happening during the the NYC event here, and the LA event here. Both events will have livestreams at various times so you can pop-in and see acts of kindness in real time, and connect via chat. The NYC event is happening from 1-4pm EST, and the LA event is happening from 11am-1pm PST. Finally on that same day (and beyond), everyone is encouraged to post their #HolidayKindness actions and activities from wherever you are in the world, no matter how great or small, on social media. Hopefully this will serve as a way to inspire others into action of their own and also to show examples of love through kindness during this holiday season. Happy holidays from all of us at Nerds and Beyond! “Mickey’s Royal Friendship Faire” to Debut June 17 at Magic Kingdom! Trailer for Episode 18, Season 12 of “Supernatural” Released!